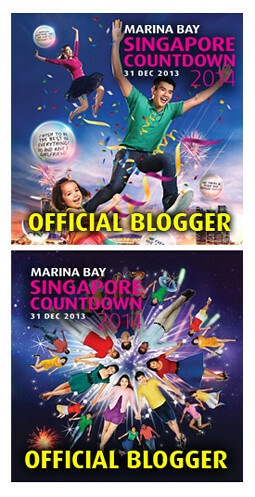 I Had A Roller Coaster Ride At HSBC World Rugby Sevens Series Cup Final! 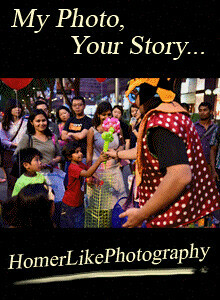 It's my third year watching HSBC World Rugby Sevens Series tournament and I have had a awesome day witnessing some of the best live rugby actions while soaked in a festive atmosphere with many beautiful people came dressed up in various colourful costumes, singing along to the songs played during game intervals, and cheering passionately for their teams. 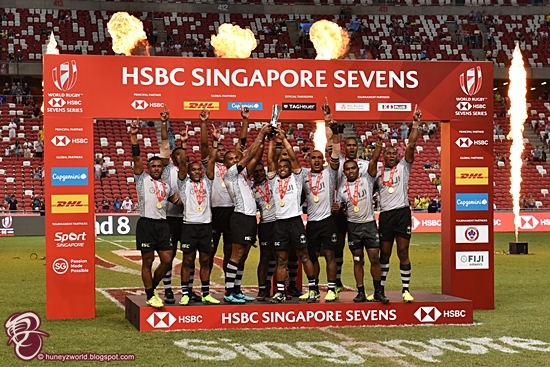 The two-day rugby festival at the Nation Stadium of Singapore kicked off with fantastic actions on 28th April with 16 teams competing in a scheduled knockout format, leading to the final on 29th April where Fiji won its third HSBC World Rugby Sevens Series tournament in a row with a thrilling 28-22 win over Australia, who reached their first Cup final. It has been a pulsating match right at the start of the Cup final. 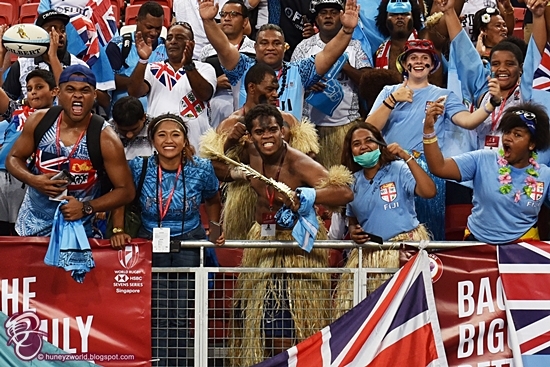 The Fijian took full advantage of their strength and speed to dominate the game in the starting 5 minutes with 2 tries and conversions before the Australians fought back with their own 2 tries (but missed both their conversions) at the end of first half. First half result was 14-10. 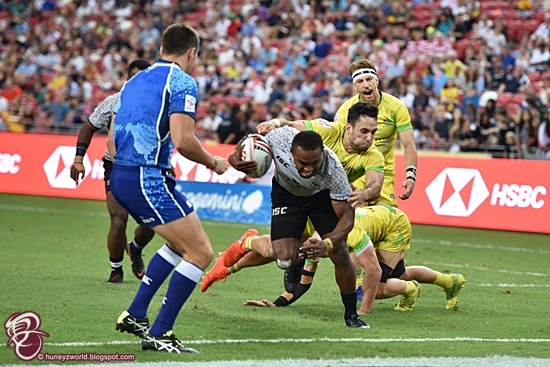 The second half started of with Fuji extending its lead to 11 points with a try and conversion (21-10) before the Australian stung the Fuji with two back-to-back tries and one conversion to gain a slim lead (21-22) nearing the end of regulation time. And that's where the magic of a Cup final happened and hence the roller coaster ride began for everyone watching, myself included, when all of us thought Australia has had sealed the game from the Fijians when the they did a try seconds into the extra time but was disqualified due to a costly dropped ball; and for this, the Australian paid dearly as the Fijians responded almost immediately to score in stoppage time to claim the 28-22 win and claim their HSBC Singapore Rugby Sevens crown! 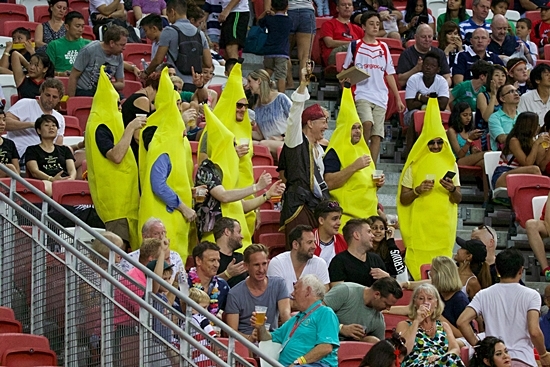 It has been a superb final for me and overall the games played at 2018 HSBC Singapore Rugby Sevens, which saw over 55,000 fans this year, has been positive with a lot of tries scored and competiting teams really went at it and put some risk into winning. With a perfect blend of pulsating on-pitch rugby action, thousands of people rocking out to disco legends Village People, and a 20,000 square feet FunZone that featured first time appearances of The Transformers, Nerf, and the Little Pony, the two-day fiesta reaffirmed its position as the biggest celebration of rugby in Southeast.